So who knew I could bake! Well, attempt to. I was on the BBC food website looking for things to try out whilst salivating over pretty much everything because I am a foody at heart and saw these by Tom Kerridge! (Who has the best west country accent ever to note.) They're originally done with dried apricots but I couldn't find any apart from a bag of £4 ones from Sainsburys... stingy? Maybe so, therefore I alternated for some Lemon and Orange instead. First off, preheat your oven to 180c/160 Fan/ Gas Mark 4 dependent on what you're using. Grease your tin and put to one side. You'll then need to slowly melt butter in a pan and add syrup constantly stirring. Take off the heat and stir in oats, salt, flour and fruit until well mixed. Scoop your heavenly smelling mixture into your baking tin and smooth out and pack the mixture tightly to the corners using a wooden spoon. 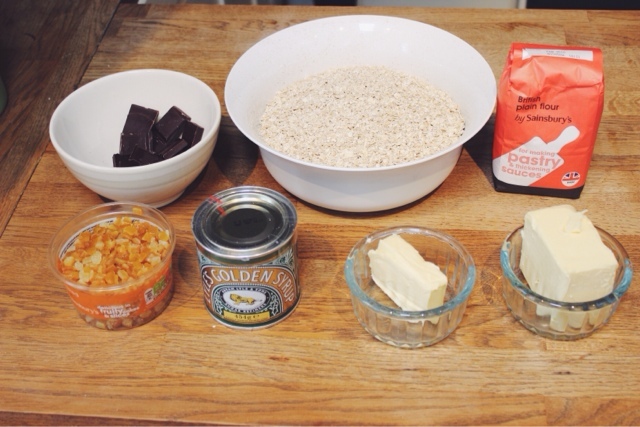 Then bake for 25-45 minutes until golden brown and allow your oaty slab (?!) to cool. Once cooled, take a glass bowl over a pan of boiling water ensuring the bowl doesn't touch the water. Melt chocolate until smooth and cover flapjacks leaving just enough chocolate for your own consumption. Leave to cool and break into pieces and enjoy!